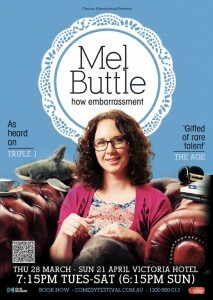 Mel Buttle is a very smooth package and an excellent example of classic standup comedy. I wonder if she learned her performance skills by watching the likes of David Letterman or Jay Leno. Possibly she has done an amazing job of translating the advice from a book. If you are wanting to write for television, I would suggest going to her show and noting how many times she uses the format: setup, punchline, tag, tag, callback, and topper. Also take note of how many times she uses saving lines. She’s brilliant with these and wields them to great effect, building her stage persona. Her show How Embarrassment is an autobiographical journey through her life’s embarassing moments. She’s an unassuming country girl from around Brisbane. Mixing this sort of material up with a slick TV style creates a sparkling and humane wit. Her anecdotal humour includes stories about how she ended up with a pet chicken, the strangeness of year eight proms, and her troubled five-year-old relationship with guinea pigs. My favourite story had to do with turning up at a country poultry club (NOT poetry club, she emphasizes). Not a false step was made in this show. She interacted beautifully with her audience and her timing was good. It was an exceptional performance.